Rental agreement is the terms and conditions made during taking rent of new premises. Such a contract is usually known as a lease in everyday language. It should be noted that the contract such taking place is a legally binding contract, breach of which entitles the aggrieved party to sue or press charges in the courtroom. These templates here provide a large number of choices to go with ranging from simple rental agreements to basic Rental Agreements. Though we recommend drafting the lease yourself if it is a complex one, there are a few complex templates offered here which the necessary person can easily modify and adapt. 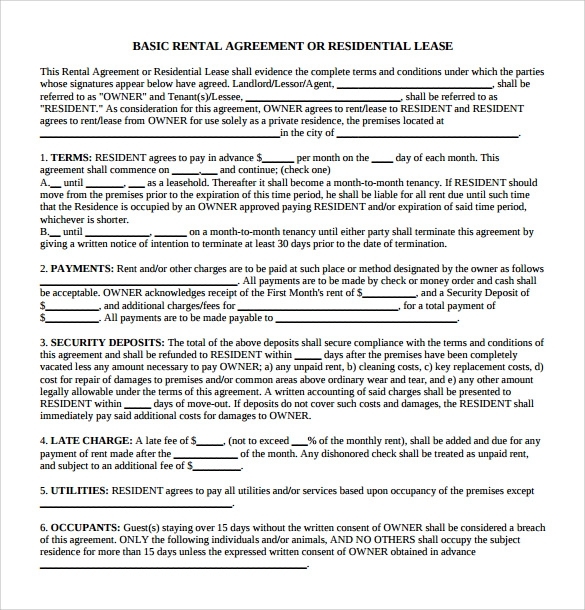 As the name suggests this house rental agreement format template follows the most basic pattern of leases or rental agreements. It begins with a declaration of identity then followed by the various terms laid out by the owner. The tenant is to go through these and agree by signing and therefore completing the contract. 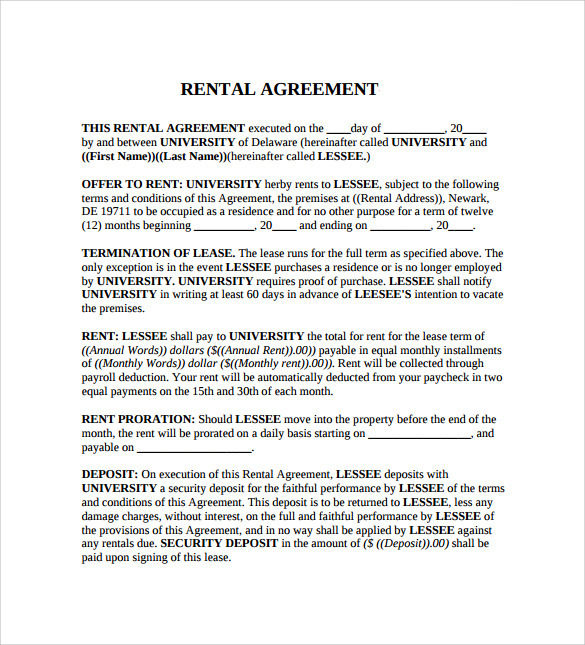 This simple lease form template is centered on a vacation rental agreement, which means it’s a short term rental. Due to this short term nature the deed is much less official with less details but it’s still fully legally binding. The template contains details like location; contact information; kitchen facilities; sleeping occupancy etc. 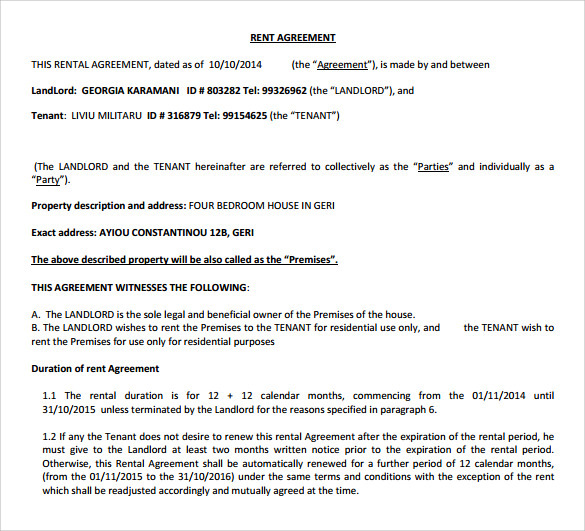 This easy rental agreement is a formal acknowledgement of factual information by both the parties. The agreement clearly lays out the terms and conditions like; absolute owner of property, purpose of renting out property, duration of validity of agreement and what to be done when current lease expires. 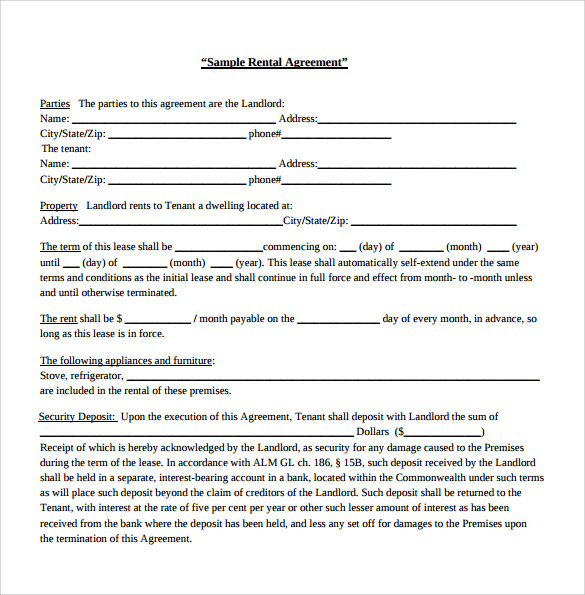 This free printable rental agreement forms template is designed with a much more rigid structure, in previous templates the tenant had options of input and choice of declaring the terms and conditions. But here it all has been decided by the owner himself, the template is merely a formality where the tenant will peruse and sign his confirmation. 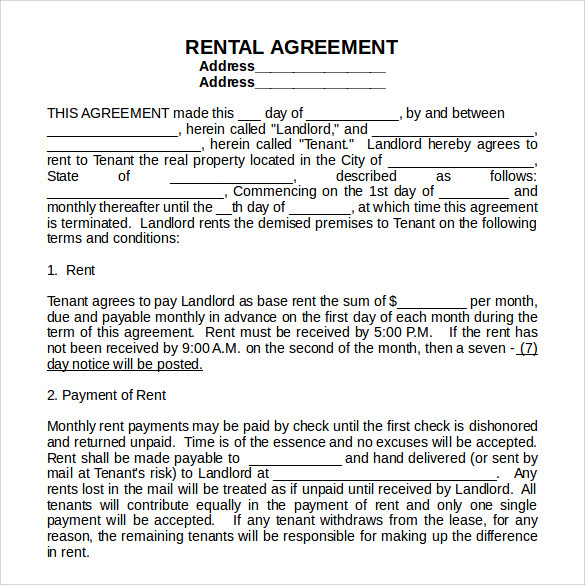 A rental agreement is the key piece of written equipment which forms between an owner and a prospective tenant during lease taking. All the necessary details are gone through between them where each individual party can voice their concerns or seek their wishes. Once totally agreed upon the rental agreement is signed by both parties for a fixed period of time after which the terms and conditions have to be re-visited and the contract re-established or renewed. The Home Rental Templates here offer a large variety of stock options to choose from to help the novice owners who wish to let out their properties. Between the two parties involved in a rental agreement, the target audiences obviously are the owners rather than the tenants. Any person looking to let out an extra room is the landlord and he gets to dictate the terms and conditions under which the tenancy shall operate. Since it is a legally binding document it is advisable to consult a lawyer about the fine print, but many persons cannot afford lawyers or it is too cumbersome a process. For these people there is provided a large number of template options, varying from basic to intricately detailed. There is one to match every need. The benefits of having a well-designed, official looking, legally binding rent contract are immense. A proper agreement gives equal weightage to both parties who are in capacity to contract and acts as an impartial yardstick for proper behavior and conduct. If any tenant is engaged in an activity which breaches the contract or vice-versa the aggrieved party can seek justice from the necessary authorities. These templates are very beneficial to both new landlords/owners and inexperienced tenants because tailor-made agreements tend to have loopholes within them to benefit one party more than the other. These Rental Agreement Templates on the other hand act as an impartial overseer to see that neither parties act beyond their capacity. We conclude on the note that a rental agreement is a serious business; failure to oversee a certain term may lead to a lawsuit or eviction. 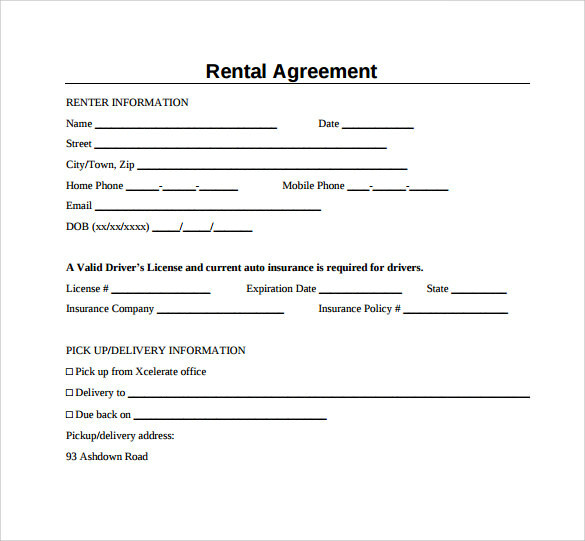 These templates have been designed to help you easily formulate a rental agreement plan and we recommend you choose you perfect fit and use it wisely.